Let’s talk about barrel racing. Barrel racing is a huge sport where we are located in Central NY. I have lots of friends that race, and many times multiple days a week. If you don’t know the point of barrel racing, let me break it down for you! The horse and rider are timed for how fast they can get around the barrels. They run through a gate where the timer starts, run around one barrel on the left or right side of the ring, then run across the ring to the other, then to the end of the ring to loop around the last barrel and race for home! It is such a fun sport to watch! Barrel racing is a sport that demands a lot from the footing. 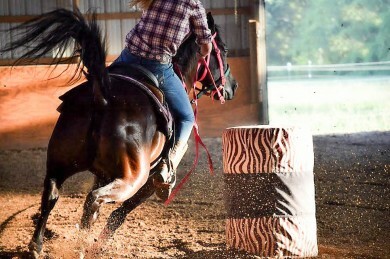 The fast acceleration and explosive turns are what makes up barrel racing. The horse needs grip to do all of these fast, tight turns. The wrong footing conditions can cause catastrophic injuries to barrel horses. It can’t be too slippery and it can’t be too hard, or too stable. Some riders like a deep footing, others like a more solid ground. A ground that isn’t firm enough can contribute to soft tissue injuries, and a ground that is too hard can lead to bone injuries. When building an arena, we recommend 3-4 inches of a large aggregate stone, a layer of geotextile fabric, and 3-4 inches of a compacted stone dust for the base. This base will allow for water to properly drain from the arena. The footing would go directly on top of the compacted stone dust. With barrel racing, we normally recommend 4 inches of either T ruStride or LiteStride. The recommended base, combined with the footing, provides the perfect grip and support that is needed to barrel race. The base has the solid foundation that the footing needs, and the footing is not too deep and not to shallow, so that the horses can dig their hooves in to quickly turn around barrels. If you ever get the chance to attend a barrel race I encourage you to do so! Watch the footing while they race, and how the horse’s body reacts to turning around the corner and running for home. Is the footing too slippery? Is it too deep? Is it too shallow? What would you recommend to the barn owner after reading this blog on how the footing should react? This entry was posted on May 18, 2017 at 12:14 pm and is filed under Arena Construction, Arena footing, Arena Maintenance. You can follow any responses to this entry through the RSS 2.0 feed. You can leave a response, or trackback from your own site.